If you’re in business for yourself, you have likely come across challenges dealing with conflict – who hasn’t, right? But as you may know, some conflicts can’t be resolved with just an apology and an “I’m sorry.” In my work with many entrepreneurs and business professionals, I have seen conflicts of large and substantial consequence heading towards law suits along with high attorney fees. With Vendors due to contracts, unclear scope of work and etc. With Clients/Customers due to finished work, unclear objectives and etc. With Staff/Employees due to harassment, workplace misunderstandings and etc. When issues involving any of these three areas occur (and as long as your business employs, hires and works with people, these will continue to occur), the business owner seemingly has only one option – Small Claims Court. There are two common assumptions people have about going to court: 1) I will get a chance to tell my story to the judge; and 2) the judge will hear how I was wronged and force the other person to pay me money. The trouble is the rules of evidence will make most of your story irrelevant or inadmissible. The judge must rule based upon law, not morality. You have to prove what you say, having evidence to support the facts you present. Very few of us know the rules of evidence, which means, the risk of getting your money just went up. 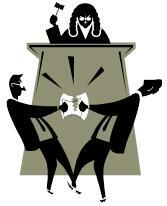 Therefore, it is often wiser to go to court with an attorney, raising the cost of getting your money. It also means you have to deal with any litigation tactics the other person’s attorney might bring to bear, raising your risk of winning. In addition, your day in court will not be only your day in court. Along with your case, the judge will be hearing a long list of other cases, so you will only have a few minutes of the court’s time to present your case, your facts, and your evidence. The quality of the job you do could determine the outcome of your future – raising your risk yet again. How much money does your business lose each quarter because the risk and the cost of going to court is too high to even try and retrieve it? What if you could present your case in a setting where you had all the time you wanted to present your story? What if you could present your facts and your story without being bound by the rules of evidence? What if you could have complete control of the outcome, not being stuck with an unacceptable outcome? What if you could do all of this without having to pay expensive retainer fees? The cost to get your money back would be considerably less and the risk would be considerably low. Lower risk and greater potential for gain is typically a formula for a wise business decision. As a business owner, would you participate in a legally binding process where you sit with a conflict specialist hearing your case if it meant a greater chance of getting your money, in less time, while maintaining complete control of the outcome? If Mediation is something you’ve considered but never tried, or haven’t considered at all, please share your thoughts and questions in the comments below. Very well presented with point-blank logic. Inspires a business owner to to make a more wise, logical choice. Sound reasoning shows in the message.